Discover these fun non-candy Easter gifts for toddlers and Eater basket stuffers that aren’t plastic junk! 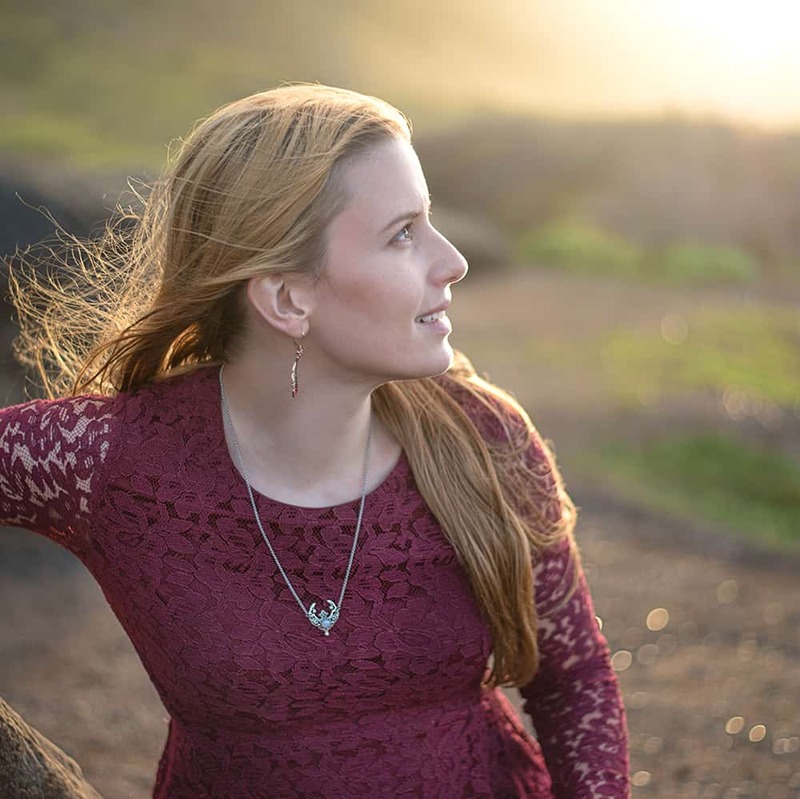 If you’re trying to go zero waste or raise a child with an ‘alternative,’ natural parenting style, holidays can feel a bit overwhelming. Like most holidays, Easter can quickly turn into a junk overload when you’re shopping for a kid. Candy, cheap plastic toys that will break in a day, and plastic grass that’s thrown away without a second thought seem so common! 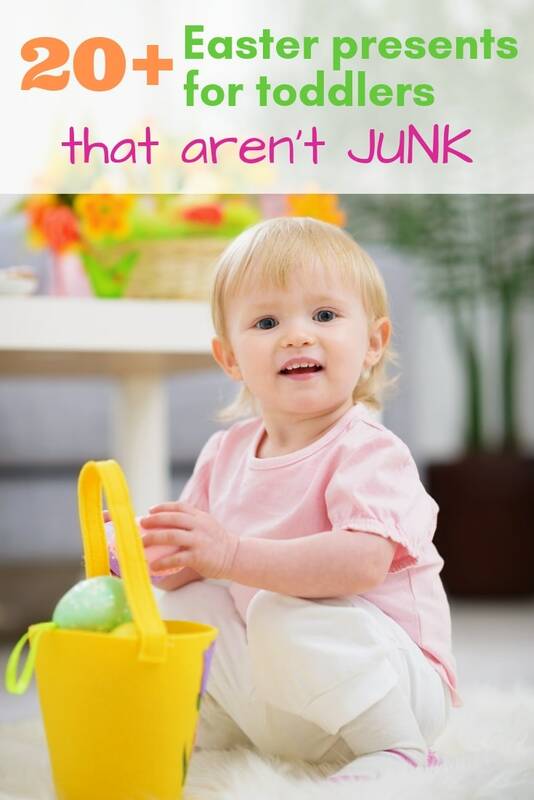 Luckily there are so plenty of adorable Easter basket stuffers for toddlers that aren’t junk available today! 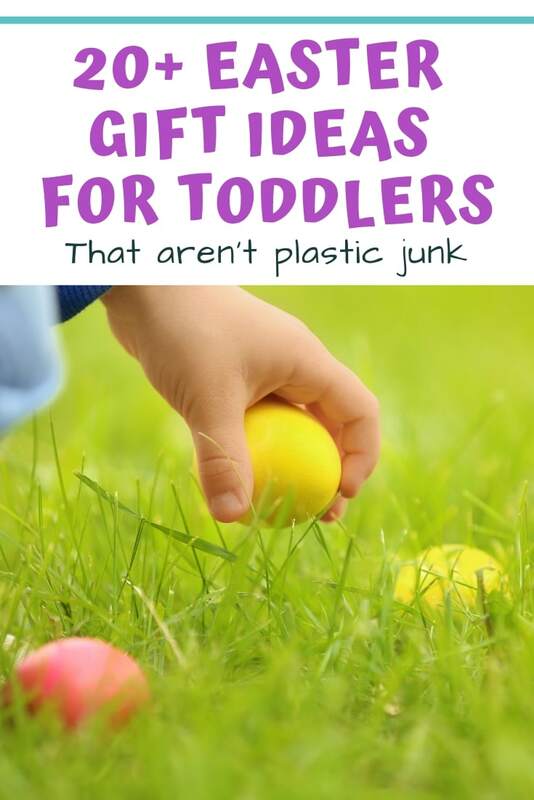 In this post I’m sharing how to have a zero waste Easter & my favorite Easter gifts for toddlers that fit well with a more ‘crunchy’ or Montessori-inspired parenting style. I hope you enjoy! As I wrote in this post on aluminum foil alternatives, trying to go ‘zero waste’ doesn’t mean you have to go all or nothing. We are far from zero waste, but we’re making conscious steps towards reducing the amount of trash we create. Using natural materials whenever possible is very important to us, especially when it comes to toys and clothing for LG. As a kid, I never had one of those pre-packaged Easter baskets crammed with plastic stuff. We always used the same baskets (and “grass”) over and over again. I know there are still plenty of Easter baskets in my mom’s attic now! 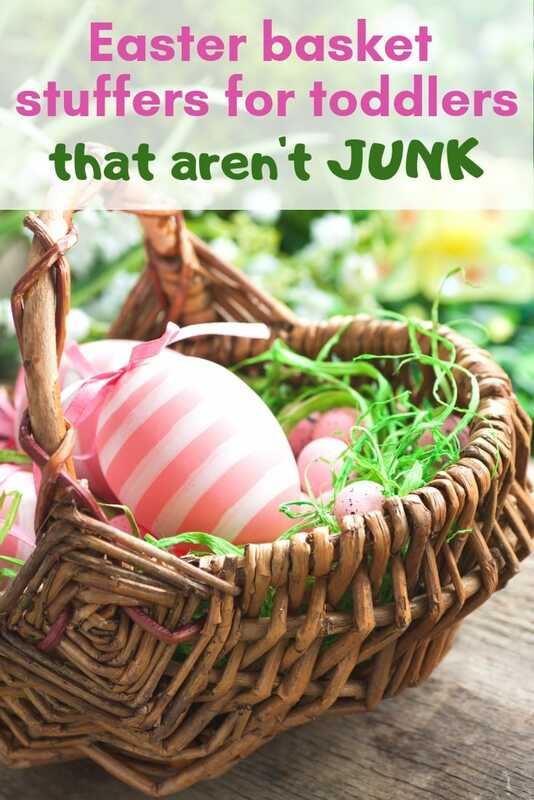 Reusing Easter baskets and filler is fantastic step in the right direction if you want to reduce your family’s trash output. There’s no need to toss out your ‘old’ plastic items – keep reusing them as long as you can, then replace them with something more eco-friendly! Decorating and hiding wood eggs! Using a non-traditional “basket” like a container you already have at home, a felted wool bowl, or even a flower pot! This handmade fabric Easter bowl would be so cute to use over the years, wouldn’t it? 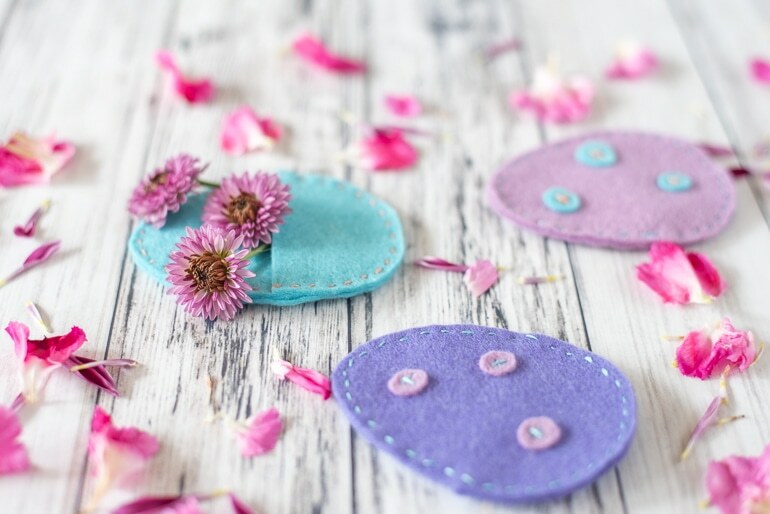 In case you missed seeing the link above, stop by this post to learn how to make your own eco-friendly fillable felt Easter eggs! They’re great for Easter baskets & egg hunts, plus they last for years! This cute little handmade wood mushroom is the perfect Easter basket stuffer for a toddler with busy hands! LG loves her twisting & turning toys – I frequently get several minutes in a row of peace and quiet when she’s playing with them! These handmade felt ducks are so cute! I love felt busy boards/books. They’re easy to pack if you’re on the go and a good way to occupy your low-media toddler. Hand kites are so much fun and great for toddlers who are always on the go! If you’re a Montessori-inspired parent (or you like to keep your toddler’s clothes “clean” whenever possible) then a cute handmade apron would be a fantastic Easter gift! You can use it as part of your eco-friendly basket filling and then your little one can wear it while helping you cook, clean, or paint. Easter basket stuffers don’t have to be toys! It’s also a great time to give your toddler an interesting new tool like a wavy cutter. Make sure to get one that you press down, not one that’s shaped like a knife, so your toddler can use it more safely and easily! Kids love getting involved with ‘cooking’ and snack preparation and a wavy cutter is perfect for soft foods like bananas and strawberries. FAST AND FANCY CUTS - Great for making fancy edges and waffle cuts on various fruits and vegetables. USE ON VERSATILE FOODS - The knife is ideal for potatoes, zucchini, cucumbers, melons, carrots, and other firm produce. STURDY DESIGN - Made of stainless steel, the knife is strong and durable, with a super sharp blade. Stuffed animals are super cute in Easter baskets! If you want to avoid the toxins and waste associated with ‘normal’ stuffed animals, go for an organic cotton plush toy. 100% organic cotton outer shell. Our products are high-quality, hypoallergenic polyester fiber inside. I’ve been eyeballing these Haba wood shaker eggs since last year! Haba is one of my favorite non-toxic toy companies (you can see some of my favorite picks from them in this post on the best wood toys for toddlers!). The blue egg requires/teaches an extra motor skill (twisting!). I love Haba toys because they’re well made, open-ended, and tend to come in minimal packaging. They also have a reputation for high safety standards. Many of Haba’s toys are still made in Germany (they also have other Western factories including a toy factory in the US!). The toys that are made in Asia are in Haba’s own factory in Hong Kong where they maintain high standards. A Haba soft doll would make a sweet Easter present for a boy or girl. I love that they have a variety of sizes with different hair and skin tones! My daughter is Latina, so whenever toys are only available blond and blue eyed it really stands out to me. I also love that they have baby wearing dolls! Dolls are beneficial for both boys and girls and can help toddlers develop empathy, imaginative play, creativity, and other important social skills.1 Who doesn’t want to help their toddler become more empathetic? Toddlers love to scribble! Our LG adores ‘drawing’ with (and on) just about everything. She also still tries to cram things in her mouth if she thinks we aren’t looking, which is why these Honeysticks beeswax crayons are perfect. They’re made with only food safe ingredients (which is good because they smell delicious!) and have lovely, vibrant colors. Spring by Gerda Muller is a sweet little board book without words. This makes it perfect for inventing your own new story each time and for multi-lingual kids. Just “read” it in whatever language you feel like using! The illustrations are lovely and show springtime activities painting Easter eggs, watching baby birds, panting seeds, and playing with lambs. I know I sometimes get tired of cartoony illustrations in children’s books so these drawings are a nice change for me, too! The Beautiful Babies Touch & Feel book is another fun one for spring! It has photographs of baby animals on brightly colored backgrounds and plenty of sensory spots to feel. Wood eggs to decorate and hide are fun and easy to reuse again another year! If you’re raising a Montessori toddler, you’ll appreciate these lovely bird matching cards! The set has lovely, realistic illustrations. The game is a little advanced for young toddlers because you match the male to the female for each bird species, but they make lovely decorations, too. Toddlers love small wheeled toys and cars. Instead of going for a plastic toy car, get a wood wheeled toy from Hape! 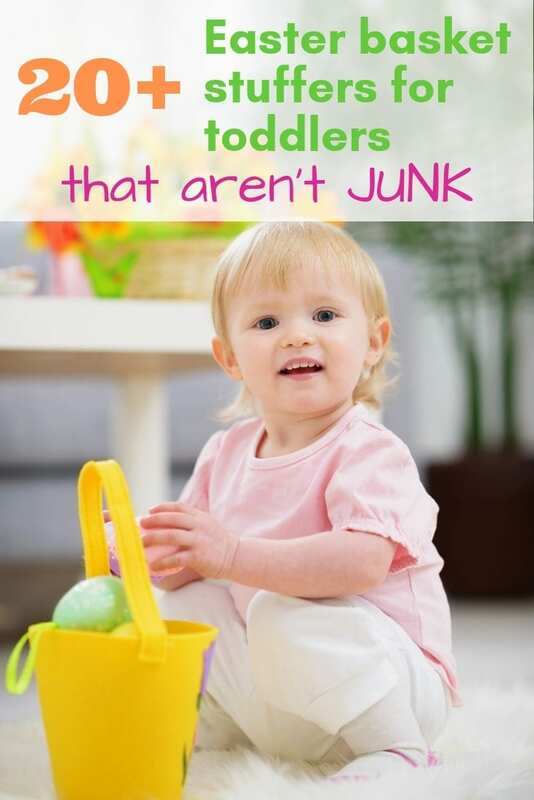 They’re non-toxic, way nicer for parents to look at, and less likely to break. Dealing with a meltdown from a broken toy is no fun – take advantage of any avoidable toddler tantrums by getting wood toys! If your toddler is ready for a lacing toy, this spring lacing set from Hape would be a great choice! Lacing toys help toddlers develop hand eye coordination and fine motor skills, plus the spring shapes are darn cute. Even better, while they’re busy concentrating on lacing up their new toys you can get a couple minutes of quiet! 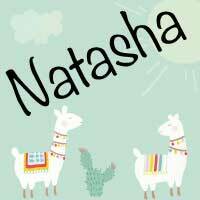 Another one of my favorite non-toxic wood toy makers, has nice wood fruit & veggie dominoes that are perfect for older toddlers. Dominoes is basically the national game of Cuba, so we were excited to find a dominoes that LG will be able to use before she can count! If you’re looking for a non-toy gift, a holiday can be the perfect time to get your toddler some cute training pants and start the toilet learning process! Making new “big girl” underwear a special gift may help your toddler want to keep it clean and dry. And there you have it! 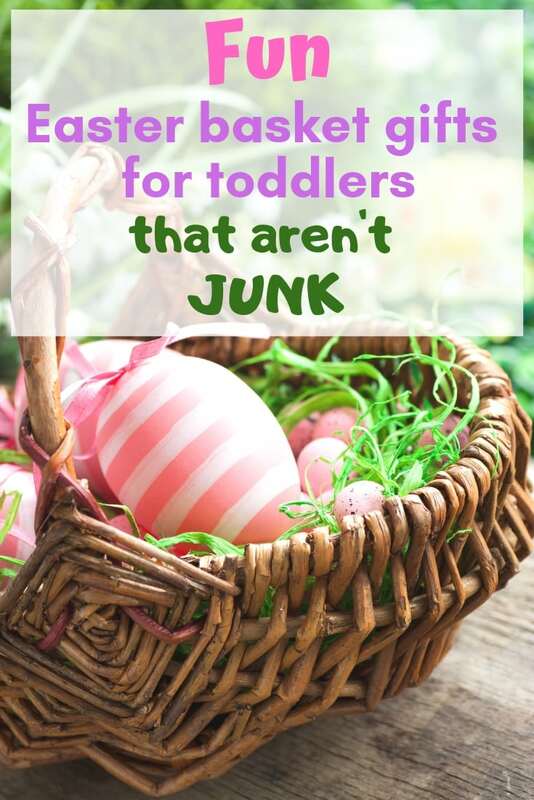 20+ Easter basket stuffers for toddlers that aren’t junk! 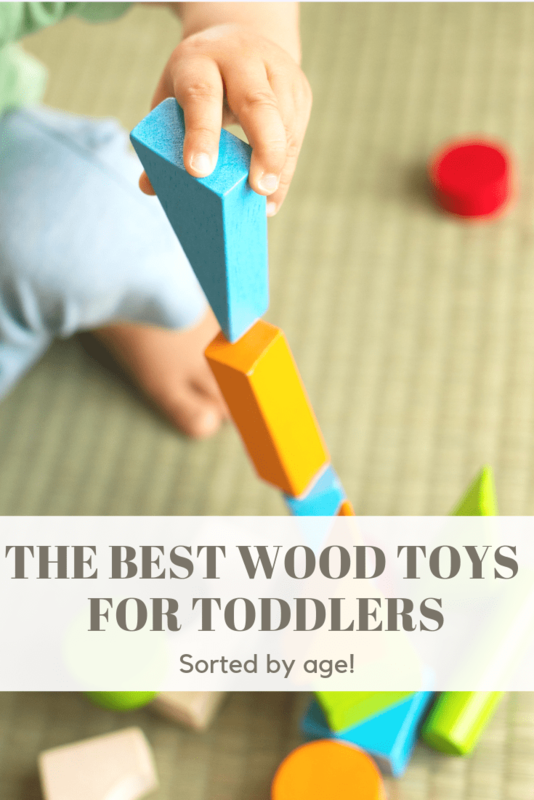 If you’re shopping for a toddler, you may also enjoy this post on the best wood toys for toddlers by age. 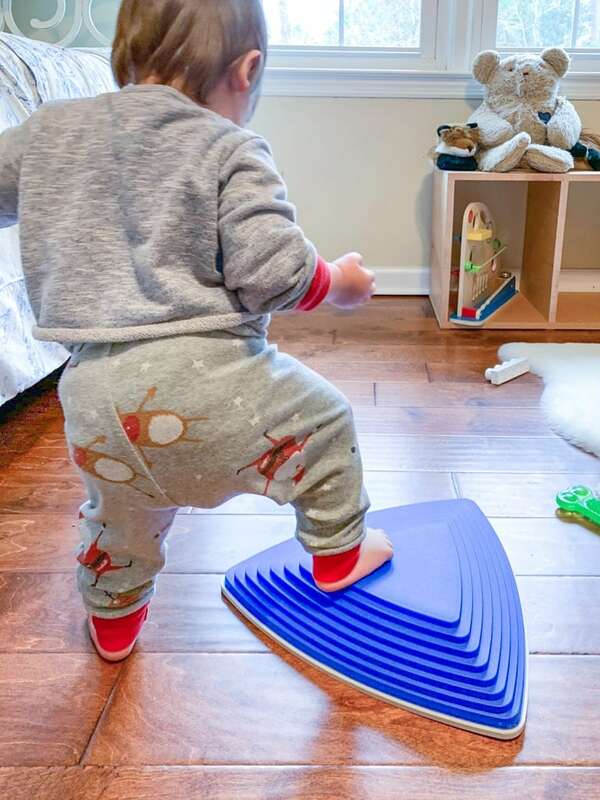 And this post on 17+ awesome gross motor toys for young toddlers! 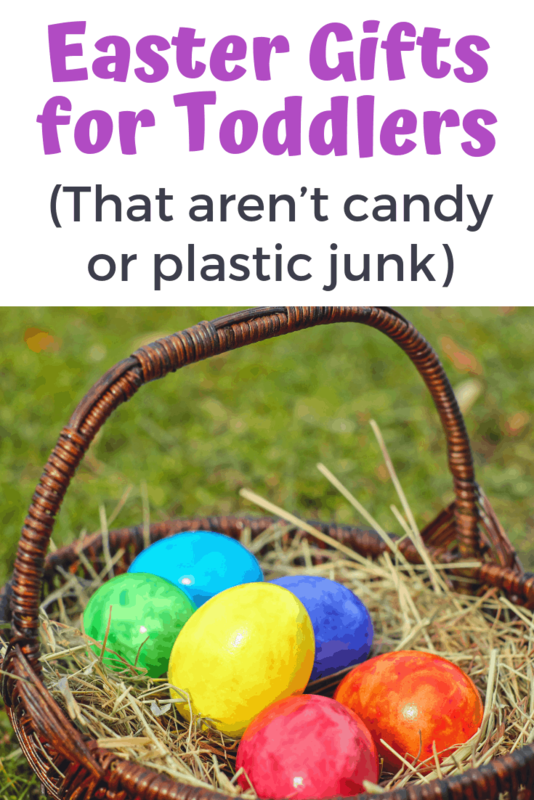 I’m sure there are many more fantastic toddler Easter toys out there – if you have any favorites or suggestions for things I’ve missed, please let me know so I can check them out!